The final finisher: The inspiring stories of last-place marathon runners – Because in this game of life the more you know the better player you will be. 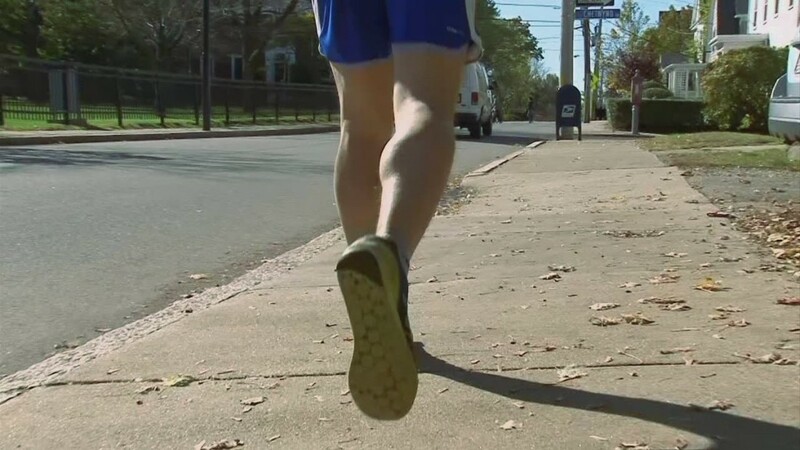 (CNN) When Simon Kindleysides crossed the finish line at the Virgin Money London Marathon this year, what followed was a blur — but he became a “superhero” to his kids, and he set a world record in becoming the first paralyzed man to complete the race on foot. When David Fraser crossed the finish line at the TCS New York City Marathon last year, it marked his 10th time completing that race, using his toes to push his wheelchair to the finish line. He was the final finisher. She was the final finisher. Lisa Jackson has run 110 marathons and ultramarathons around the world. After each, she has a tradition of sleeping with the new medal around her neck to celebrate her accomplishment. In 25 of those races, she was the final finisher — and she revels in coming in last. The world often hears the inspiring stories of elite athletes who finish first after running 26.2 miles in marathon races. For instance, Olympic medalist Shalane Flanagan broke the finish line tape at the New York City Marathon last year, becoming the first American woman to do so in 40 years. 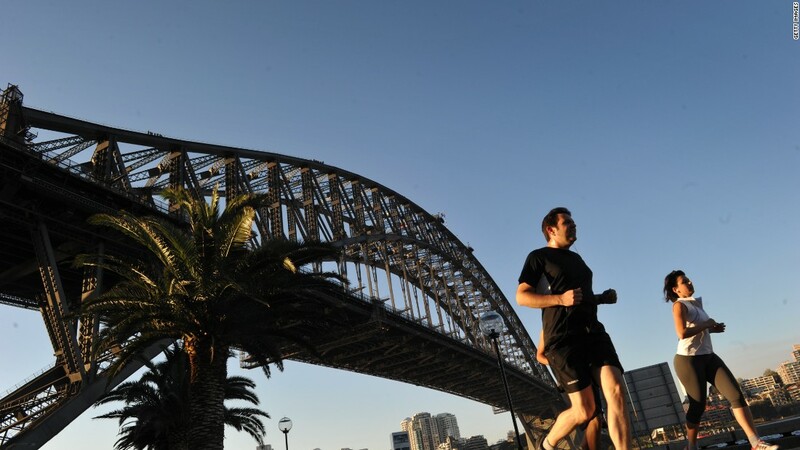 This year’s marathon is scheduled to kick off Sunday morning. On average, it takes bout 4½ hours for men and women to complete a marathon, Ciaccia said, but that time can vary drastically among racers. 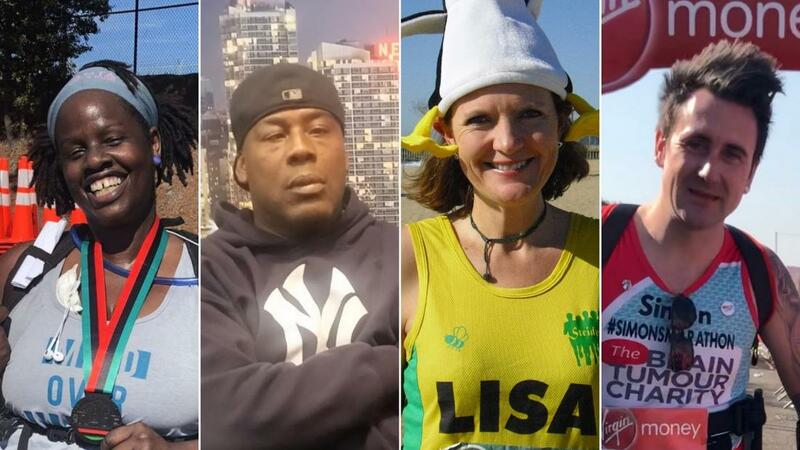 In honor of Sunday’s New York City Marathon, where more than 50,000 people traveled through the five boroughs, here are four inspirational stories from the last racers in half- and full marathons. One thing they have in common: They never gave up. 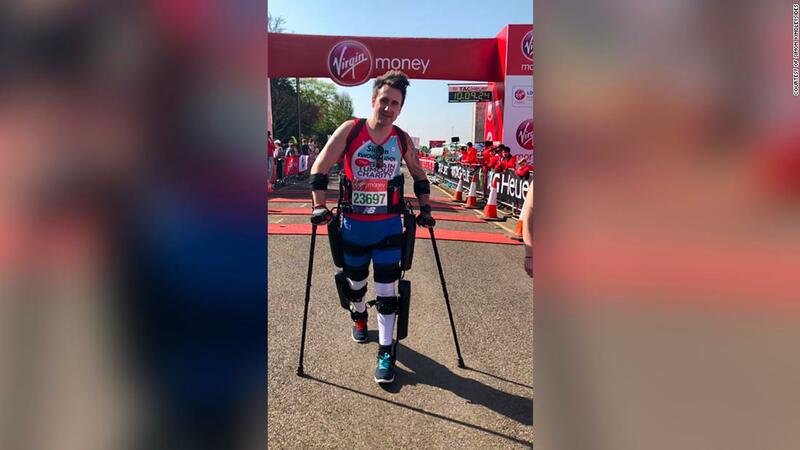 As Simon Kindleysides, 34,took his first steps in the London Marathon in April, it felt as if magic was in the air. As time went on, the crowds and other racers dispersed. Kindleysides and his team of eight supporters continued walking. 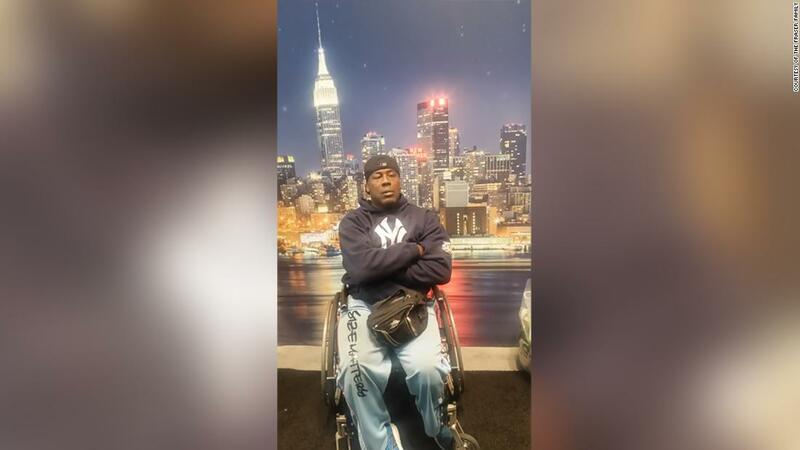 Kindleysides, who is paralyzed from the waist down and typically uses a wheelchair, was equipped with an exoskeleton to help him walk. His supporters walked with him to change the batteries in his exoskeleton so he could keep moving. “I can walk up to four miles consecutively on one charge of the battery,” he said. In 2013, Kindleysides was diagnosed with a brain tumor — a benign glioma — that was growing in a way that pressed on certain nerves, leading to him losing feeling in his legs. He was told he would never walk again. Before his paralysis, the London-based singer and dancer had “always wanted to run a marathon,” he said, but he never made the plans to do so — until this year. During the London Marathon, the last two miles were the hardest. “At that point, I was exhausted. It was freezing cold, and I was hurting and emotional,” Kindleysides said, but he kept going. So he continued and made history as the first paralyzed man to complete the London Marathon on foot. Then, recovering at home, he shared his accomplishment with his three children. “I was called RoboCop, Terminator and every superhero you can possibly imagine,” Simon said. Kindleysides is training to complete three more marathons next year, including the London Marathon again. Meanwhile, a final finisher in the United States is preparing to run his 11th New York City Marathon on Sunday. David Fraser, who was born with cerebral palsy and uses a wheelchair, had competed in the New York Marathon before. Racing wasn’t new to him, but being the final finisher last year was — and he enjoyed the moment. Fraser said that last year he was focused on his personal training company and didn’t devote as much time to training for the marathon as he normally does. “My wife and my kids were there. They meet me at the end of my race every year, and they couldn’t believe I was the last one, because I had done many races. I had done 5K, I had done half-marathons, I had even done ultras — but never have I done that,” said the 51-year-old New Yorker who owns a company called Nightwarriors Fitness. Cerebral palsy, a group of disorders that affect muscle coordination and body movement, impacts much of Fraser’s body — but that hasn’t stopped him from pursuing his love of fitness. Before 2007, he spent much of his free time weightlifting and bodybuilding, but that year, his co-workers challenged him to run the New York Marathon. He took on the challenge and completed the race. He has set out to finish it every year since. “That next year, 2008, my wife developed stomach cancer, and now every year, I run the race for my wife,” said Fraser, whose wife still attends his races. Fraser is preparing to complete the New York Marathon on Sunday, and he’s looking forward to the race. Amina Abdul-Jalil started running last year, around the time her mother was diagnosed with breast cancer. “I realized in that time, I don’t think it was even the whole month, that I had gained 10 pounds, and I was just stressed, and I thought, ‘I need to do something now, or this isn’t going to end well,’ ” Abdul-Jalil said. So she joined a running group called Black Girls Run. “To be completely honest, it’s been a lifesaver in a very real way, because I have major depressive disorder,” she said. Regular exercise such as running can help curb symptoms of depression, something that Abdul-Jalil said she noticed firsthand. 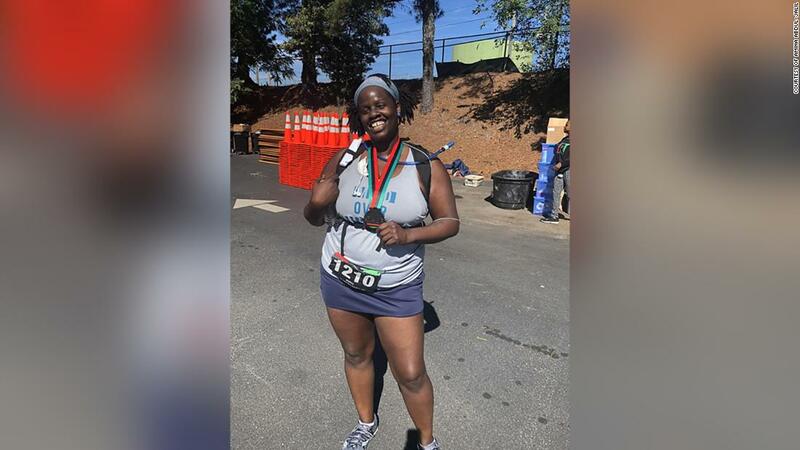 As she continued running with the group, an opportunity arose to join in an inaugural half-marathon in Atlanta called The Race, but Abdul-Jalil was hesitant. Then she saw a video clip of ultramarathon runner Mirna Valerio, a runner with a body type similar to her own. Then she registered for The Race and trained for 12 weeks. Abdul-Jalil and I both ran that half-marathon last month. Watching her finish the race is what inspired me to seek out the stories of final finishers. She told me that she ran the race simply to see whether she could do it. “Running is something that I didn’t think I’d ever be able to do because I was a kid with horrible asthma,” said the 41-year-old mother, who lives in the Atlanta area. “And I’m not FloJo-built,” she added, referencing late track-and-field athlete Florence Griffith-Joyner, who holds the 100-meter and 200-meter dash world records for women. Around mile three, a medical director approached her, indicating that her pace was such that the finish line might close before she got there. If that were to happen, Abdul-Jalil might not receive medical assistance if she needed it, the medical director said. In that moment, Abdul-Jalil felt discouraged. “I wanted to cry and quit, and it took maybe another two miles to get that out of my head,” she said. 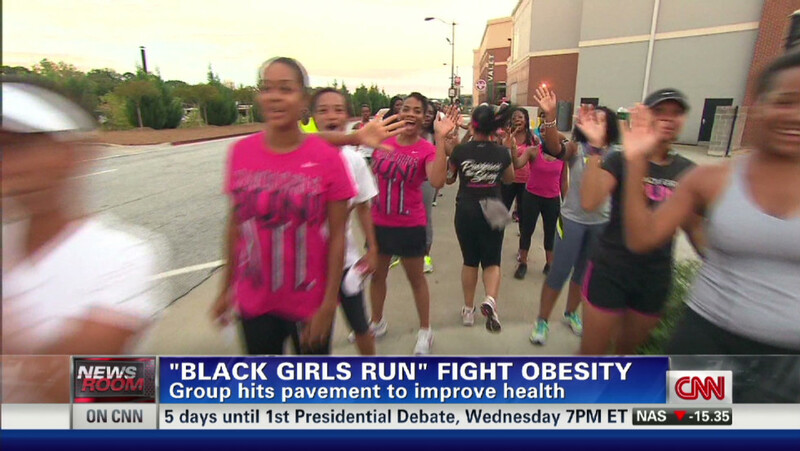 To keep her going, she thought about the running group, Black Girls Run. “By the last two miles, it was just me,” Abdul-Jalil said. A couple of days later, Abdul-Jalil watched the video, which has gotten more than 2,000 views. Being the final finisher is something that one runner in London not only would do again, but has done 25 times. Lisa Jackson loves being the last runner. “When you’re last, it’s a sense of occasion. People really admire you for your grit when getting there,” she said. 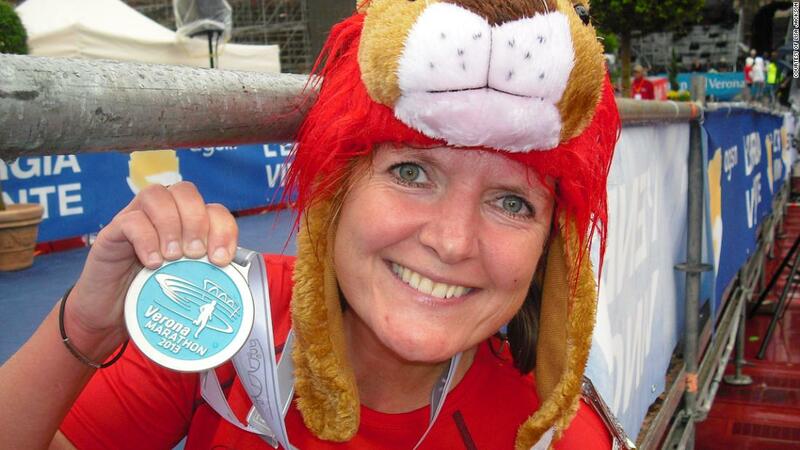 Jackson, 51, was “incredibly unathletic” as a child and ran her first marathon when she was 31. “After the indescribable feeling of accomplishment and joy, I thought, ‘I have to experience this feeling every year, at least once,’ ” she said, and so she set out to run at least one marathon annually. Jackson ran the South Downs trail marathon in the UK in June 2012. The course was hilly, the summer heat was grueling, and she wanted to give up — but she kept running. Jackson realized that she was the last runner when she saw a man on a bicycle taking down the distance markers along the course, she said. They spoke as she continued on her way, and she made a friend. Next thing she knew, she was approaching the finish line, where other runners and race organizers gave her a standing ovation. “I no longer have any fear of coming last, and if there’s a risk of coming second to last, I try to drop back a little to ensure I’m in last place as we cross the line,” Jackson said. After all, in that moment on the South Downs, she realized that when runners are not stressed about their time, the people they can encounter and the relationships that form can make a race that much more worthwhile. “My philosophy with running is that it’s not about the time you do but the time you have,” said Jackson, who went on to run the New York, Boston, London, Chicago and Rome marathons, among dozens of others. “I think it’s really funny when people feel sorry for me for coming in last. … I think, ‘well, how many races have you run?’ ” she joked. Previous Review: Stormzy has written a book, but is it any good?